The Painted Desert is sprawling, its reach extends from the Four Corners, west to the Grand Canyon and south to Petrified Forest National Park. In total it encompasses 7,500 square miles and is full of colorful mesas that are worthy of its name. In late November 2017 Alex and I took a road trip from Tucson to Las Vegas, stopping at all of Arizona's national parks on the way. Our second stop was at Petrified Forest National Park where we planned to spend a night in the Painted Desert. The park doesn't have any trails in its backcountry nor does it have designated campsites so we knew we were in for quite the adventure! Are permits required? Yes, and they are free! They cannot be reserved ahead of time, though, so you will have to pick them up on the day of or day before your trip. 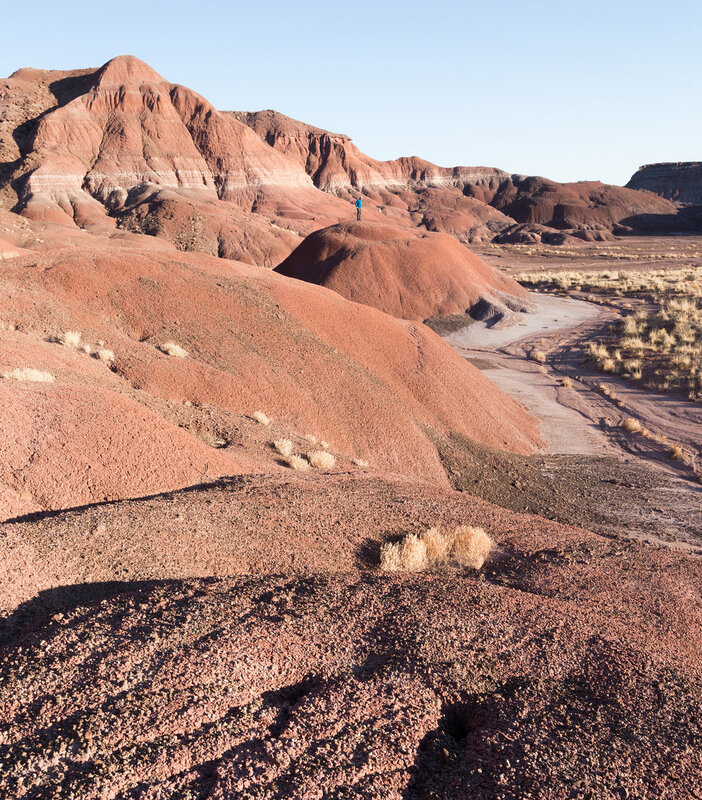 For a hike along the Lithodendron Wash into the Painted Desert you will need a permit for Zone 3. How to get to Petrified Forest and the trailhead: Petrified Forest is located in eastern Arizona, 212 miles (about 3.5 hours) from Phoenix. There is a northern and southern unit of Petrified Forest and the Painted Desert is accessed from the the northern unit. Once you stop at the Visitor Center and pick up your permit you will continue two miles to the Painted Desert Inn. Once you're geared up and ready to head out for the night, descend the trail just to the left of the inn. When to go: This hike can be done year-round but is best done in the spring or fall. Trail-less terrain - The unique part of this trip is that you can explore as deep into the backcountry as you'd like or you can stay nearer to civilization if you don't feel comfortable off trail. The park service requires you to camp at least one mile from the road but since the Painted Desert Inn is situated high on a hill you can walk for quite a distance and still keep an eye on your starting point. Backpacker Magazine put together a thorough trip report here, complete with plenty of GPS coordinates for you to follow! Water - There is no reliable source of water in the backcountry so you will have to carry all of your water with you (the typical rule of thumb is to carry at least one gallon per person per day). Petrified Wood - Please don't take any petrified wood from the park. The amount of petrified wood in the park is shrinking each year because visitors steal pieces. This ruins the experience for future park-goers. The gift shops have pieces available for purchase if you want a keepsake! These pieces are found on private properties and the owners then sell them to the park service. Extra layers - it gets quite cold at night!